Ladies warranted pure Irish linen handkerchief made in Ireland, white with delicate floral lace border. Ladies warranted pure Irish linen handkerchief made in Ireland, white with delicate floral lace border. This fine linen handkerchief can be embroidered with mongrammed initials or a name of your choice. A beautiful and unique gift for a special lady. Just fill in the option boxes and select a letter font style and thread colour. We can add a motif such as a heart, holy cross or little flower, just choose from the drop down options menu. If you want a gift set of 3 hankies tick the option box. 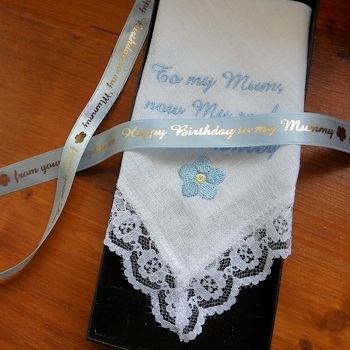 Optional Gift Presentation: Have your handkerchief in a organza gift bag, gift box, or a gift box with a personalised printed ribbon tied around (Ribbon can indicate the occasion or who the gift is to and from!) Additional fees apply. Please allow at least 48 hours for personalised orders to be dispatched as they are made to order by Amys Gifts.